The head is a four square ball painted white. I drew the mouth with a sharpee. The eyes are black mesh I found at my parent’s house. The suit I bought at a thrift store for $4 and used the same white paint to add the stripes. As for the collar of the costume I just used an old black shirt which I covered in hair gel and hair spray to make it stand up. Funny thing is that I needed the collar to dry faster so I put it in the oven and accidentally caught it on fire!! The result was awesome crisp and straight (slightly browned) spiky collar. 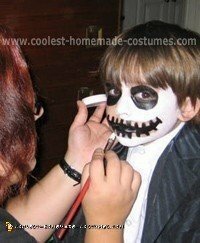 My son wanted to be Jack Skellington from Nightmare before Christmas this Halloween. 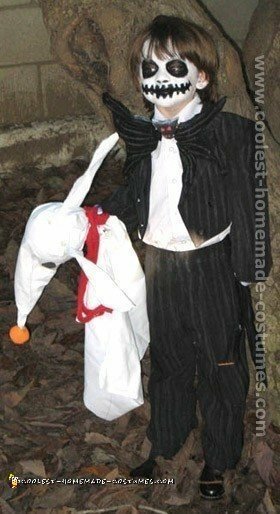 I started searching on the internet and found the idea for his Jack Skellington costume on the coolest-homemade-costumes.com site. It cost hardly anything to make because I bought almost the whole outfit from a thrift store. I got a black jacket and pants. To make the jacket look like a tuxedo I cut it in the front and sewed it at an angle. I took all of the buttons off except for the top one. I got the back and cut it up in strips to look like the tattered tails that Jack has on his tuxedo. For the bow tie I got some black Crayola modeling dough and made a bat. I put white dough on the bat for the eyes and fangs. Then stuck wire on each side and glued black felt around it to make the tie stick out. I used chalk and made faint lines all over the top pants and bow tie. The idea I saw said to use tailor’s chalk but that didn’t work on the material I bought. Regular board chalk worked great! Also it’s much easier to make a coat into a tuxedo top then to try and find a tuxedo with tails for a child. I started looking for a tux first. With no success, I came up with the idea to make a jacket into the tux. I also made Zero the dog as an accessory. I got a foam ball and stuck a wire in one end. Then, I cut off the corner of a white pillowcase and sewed it on to make the head. I drew the eyes and mouth on with a black pen. For the body I cut the end off of the pillowcase and sewed it to the head. Zero has a pumpkin nose which I made out of orange dough and stuck it on the end of the wire. I put a red ribbon around his neck and tied a black string to it for a handle. 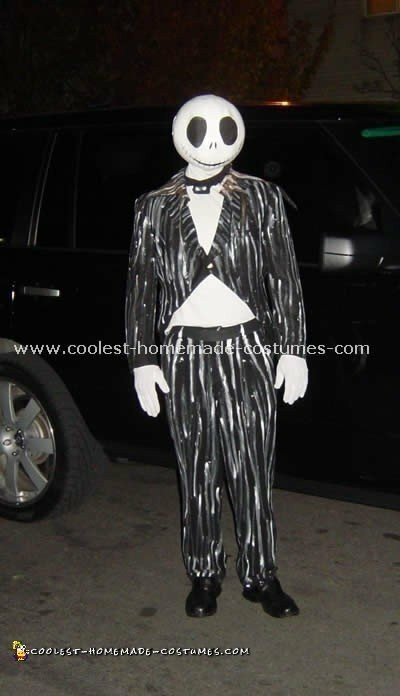 This Jack Skellington costume turned out great and my son loved it! 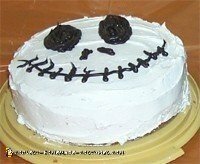 My 3 year old son’s (now 4) favorite movie since last Halloween is Tim Burton’s “The Nightmare Before Christmas.” His birthday is Nov 1st, so this year we had a Halloween Birthday party with the whole Nightmare theme. He wanted to be Jack so thought I could make him a costume. He had some black pants with pin stripes on them already so I bought some black fabric with stripes on it. I used a pajama top pattern to make the shirt. Then I added a collar that I zigzagged points and put pipe cleaners inside to give them some stiffness. I made the back of the shirt extra long and jagged cut and zigzagged the edges of that. It was fairly simple, I, being a sewing novice. 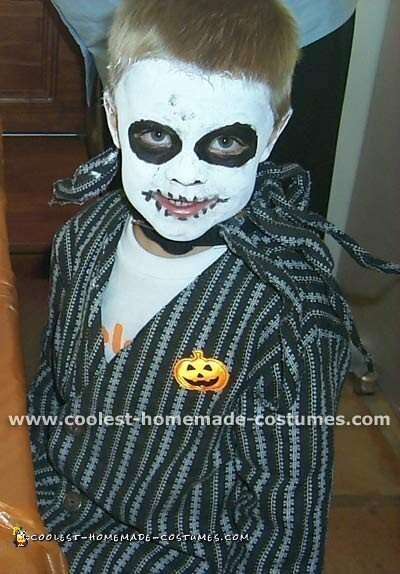 We painted his face white and black around the eyes and painted a skeleton mouth. He looked great and had so much fun being “Jack.” This is a fairly cheap Halloween costume. My 3 (now 4) year old son LOVES Tim Burton. In fact, he loves anything to do with monsters or scary ghosts, zombies, etc. He did NOT get that from me ;). He decided that he’d like to wear a Jack Skellington costume, the Bone Daddy Pumpkin King from the Nightmare Before Christmas for Halloween. I don’t do a lot of sewing so when I make a costume, I buy things and alter them to fit. Jack wears a pinstriped tux, so I went on ebay and found a brand new black tux with tails for only $30! I bought it and drew pinstripes on with tailors chalk so they could be removed afterwards and the tux could be used for a wedding he’ll be in later this month and resold after. Jack also wears Italian boots so I found a pair of black cowboy boots that I knew he could use for more than just Halloween. All that was left was to make the tails on the coat ragged and to make Jack’s ragged bat bow tied. I bought some black felt and loosely stitched it onto the ends of the tails and drew the pin striping on it too. Here’s how I made the Jack Skellington costume bowtie… I got some Crayola modeling dough that dries when left out and is very lightweight. I molded a bat head out of black and added red eyes and fangs. Then I cut up some wire and stuck it in the side. I cut pieces of felt to look like the ragged ends of the bow tie and glued it to the wires to make it stay sticking out. 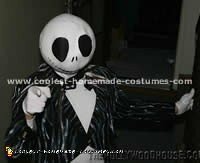 I used white face paint and then just drew black around the eyes and a big skeleton smile! 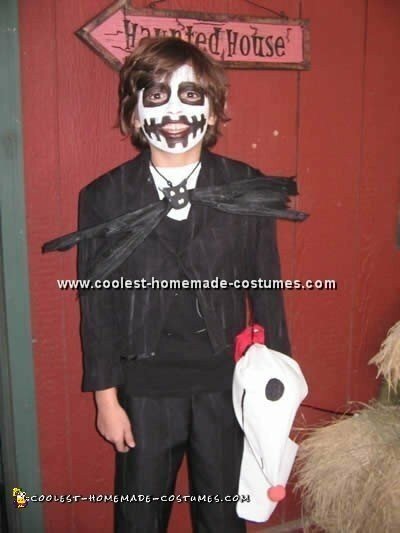 He looked GREAT in his Jack Skellington costume! He even won a free ice cream cake from our local ice cream parlor for his Jack Skellington costume. (Although, I’ll warn anyone that a 3 or 4 year old and full face make up can be a bit messy after awhile). 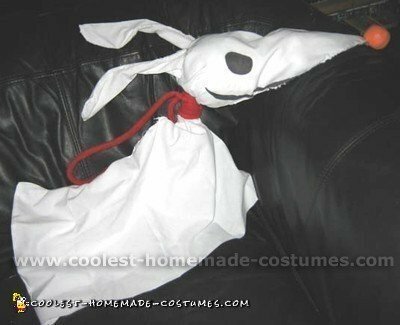 To go with his Jack Skellington costume, I made a custom-made treat bag shaped like Jack’s ghost dog, Zero. I bought two cheap pillowcases (since our fabric store is really far away and Kmart is closer!) and a large foam ball. I took some wire and stuck one end into the foam ball. Then, I covered it with some fabric, which I stitched together to make a cone shape. For the body, I cut the end of the pillowcase off and then cut a hole in the middle. I cut another corner of a pillowcase and made it into a smaller bag, which I then stitched inside the bigger pillowcase so that the hole opened into the smaller bag. Then, I attached the head and body with a few good stitches and then wrapped the neck with some red fleece strips I had left over (ribbon or something would work fine too) to make the collar. I also used that to make handles, which I attached to the collar and to the back of the body. I drew the eye and smile on with a black permanent marker. Zero’s nose is a pumpkin. So, I used more of the Crayola modeling dough to make a pumpkin and used some black to put a jack-o-lantern face on him. He looked great and my son loved him!